GETTYSBURG, Pa. (January 20, 2019) — OPEN MINDS and CapGrow Partners are pleased to announce that Josh Boynton, Vice President of Aetna Medicaid, a CVS Health business, will kick off The 2019 I/DD Executive Summit, with his keynote session, “From Managed Care Planning To Execution – The Future Of Financing & Service Delivery Models For The I/DD Market.” The Summit will return to the Sheraton New Orleans in New Orleans, Louisiana for the second consecutive year on Monday, June 3, 2019. 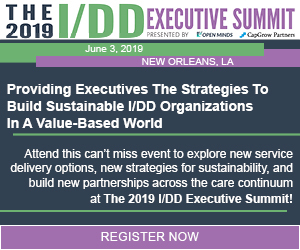 The 2019 I/DD Executive Summit is designed to give executive teams the strategy tools they need to build sustainable organizations in a value-based world. This year, the Summit will focus on improving performance outcomes, preserving consumer self-direction, and exploring new partnerships across the care continuum. “We are looking forward to building on the success of last year’s sold-out event, and continuing to offer I/DD executives applicable strategies and thought-provoking ideas that they can immediately implement into their organization,” said CapGrow Partners Founder & CEO, Matt Pettinelli. Josh Boynton currently serves as the Vice President of Aetna Medicaid. Working with various stakeholders, including the Aetna Medicaid National Advisory Council, Mr. Boynton is responsible for developing Aetna’s innovative approach to support people with complex needs, such as those with Intellectual and Developmental Disabilities. Aetna Medicaid plans serve approximately two million Medicaid members in 16 states across the nation, all with diverse ethnicities, social complexities and health needs. Prior to joining Aetna, Mr. Boynton and his wife Rachel started LifeShare in 1996 with the intention of creating an organization that supports people of all abilities with dignity and respect. Under Mr. Boynton’s entrepreneurial leadership, he grew LifeShare into a nationally recognized, COA-accredited, multi-state, multi-million-dollar organization. Collectively, Mr. Boynton developed sustainable and scalable “go to market strategies” around person-centered, and whole-person health plan solutions, including a fully integrated managed care program for individuals with developmental disabilities. LifeShare was acquired by the Centene Corporation in 2013 and Mr. Boynton stayed on as President and CEO during the integration and served as Chairman Emeritus through 2017. Previously, Mr. Boynton served as Managing Director for VERTESS, a nationally recognized Mergers and Acquisition firm specializing in health care consulting and advisory services and received his CMAA at Pepperdine University. Mr. Boynton received his bachelor’s degree from Keene State College in Psychology, with a concentration in Clinical Psychology, and graduated with a master’s degree in management/leadership from New England College. For a complete list of sessions, speakers, and registration options, visit the Summit website at https://idd.openminds.com/. Registration is now available by clicking here and is limited to 200 registrants. We recommend registering now as the I/DD Executive Summit is expected to sell out. Along with the Summit returning to the Sheraton New Orleans, The 2019 OPEN MINDS Strategy & Innovation Institute will return from June 4-5, 2019. This year’s Institute focuses on the strategy, service line development, and innovation management tools executive teams need to move their organization from the concept of value-based reimbursement, to success in the new financial normal. Registration and additional information for The 2019 OPEN MINDS Strategy & Innovation Institute is also available. Early registration is encouraged as the Institute is limited to 500 registrants. Register today at https://strategy.openminds.com/register. Registration for The 2019 OPEN MINDS Strategy & Innovation Institute is also available. Early registration is encouraged as the Institute is limited to 500 registrants. Register today at https://strategy.openminds.com/register. For additional questions and inquiries, please contact Sarah Threnhauser, Executive Vice President, OPEN MINDS at 717-334-1329 or events@openminds.com. To learn more about sponsorship opportunities for The 2019 I/DD Executive Summit – Presented By OPEN MINDS & CapGrow Partners, contact Tim Snyder, Executive Vice President, OPEN MINDS at 717-334-1329 or tsnyder@openminds.com. CapGrow Partners (“CapGrow”) offers unparalleled experience and resources in providing safe, secure and appropriate housing for individuals in need of support services. CapGrow’s tailored lease programs are designed to enhance provider operations while at the same time advancing financial objectives. The Company’s committed, responsive and experienced team is different from other organizations in that they come from a background that directly supports their work, and the work of their partners. In fact, there is no other company today that can match the combination of experience and resources they offer. CapGrow was recognized for the second consecutive year as both one of the Nation’s and Chicago’s “Best and Brightest Companies To Work For” in 2018. To learn more about CapGrow Partners please call 773-327-7691 or visit, www.capgrowpartners.com..